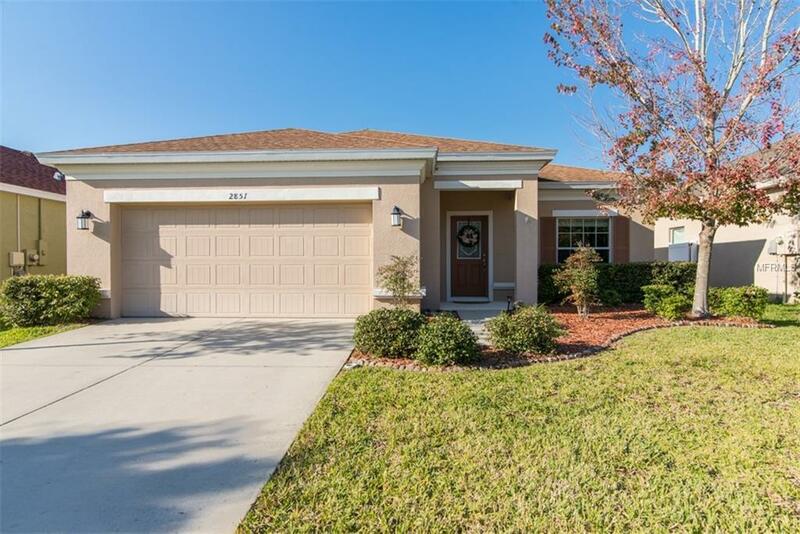 Fantastic, three way split floor plan in highly sought after Stonebrier. The home is situated on a loop with very little traffic, and in gated Sweet Grass. When entering you'll notice plenty of light with the glass insert front door. Cozy family room opens to the kitchen (granite and stainless appliances) and eat in breakfast nook. The dining room is oversized and perfect for a wet bar or smaller seating area. One bedroom (with closet) is at the front of the home and makes a great office as well. Two additional bedrooms share a comfortable bath. Master has a walk in closet separate from the double sinks, garden tub and shower. Enjoy Pergo and vinyl flooring, and ceiling fans through out! Walk out back to a fully fenced yard and screened lanai with a stamped concrete pad, and ceiling fan. Garage, off laundry room, has fresh epoxy flooring to give that clean feel! Enjoy your clean dishes with the newer water softener. This home is a newer home, so with it comes a newer roof, newer A/c, newer hot water tank, ceiling fans, etc... Come join the wonderful Stonebrier Community. Amenities include soccer and cricket fields, basketball court, well equipped fitness area, resort style pool with zero entry, miles of beautiful, peaceful walking and a gated community! A rated schools!